“Old man bars”, as they are sometimes called, can be found around Istanbul but often lack the rhythm and texture of what we expect. 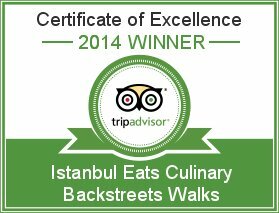 We had all but given up on the search, until a certain little no-name joint on Tarlabaşi Bulvari attracted our interest. Every morning the owner basks in the few moments of sunlight that this otherwise dark room enjoys, by sitting behind the weathered marble counter reading the newspaper and feeding a cat that sits beside the beer taps. Beside them on the bar sits an ancient jar of pickles that reminded us of the pickled eggs and pigs ears we used to balk at in taverns back home. Inside and down a short flight of stairs, formica tables and well-worn vinyl padded chairs form neat lines around the single attraction of the place, the television. Niches in the walls hold dusty bottles of liquor like trophies from better days – Teachers, J&B, long departed brands of raki. 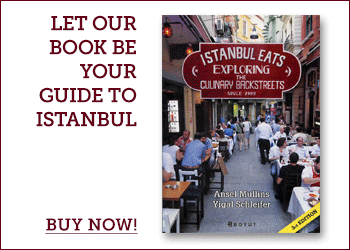 For a city as old as Istanbul, surprisingly, 30 years of business is a very long time. In Tarlabaşi it is nearly unheard of. The bar was born in the dark days of the eighties when the area had largely been deserted by the working class Greek families that built Tarlabaşi. It survived the demolition of hundreds of buildings for the construction of the major traffic thoroughfare, Tarlabaşi Bulvari, which now passes by its doorstep. It fared the rough and tumble nineties when villagers arrived en masse from Eastern Anatolia, finding cheap or sometimes free places to stay in the backstreets around here. And now, as the neighborhood starts to gentrify, the bar will likely see a new, younger clientele coming in for a cold one after work. Unlike nearly every other establishment on Tarlabaşi Bulvari, there is nothing seedy about this place. And unlike any other public place in Istanbul, monastic silence reigns. Settle in for a meditative duble raki and a small plate of cheese and melon among the neighborhood old timers and you might feel a twinge of nostalgia for an Istanbul long gone or maybe that corner taproom back home. 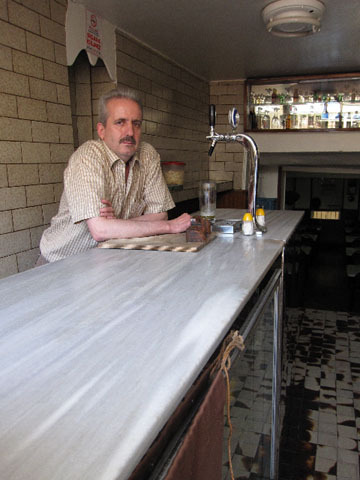 another one of these “old man bars” is çırağan birahanesi in beşiktaş. a very small 2 floor birahane with its very unintentionally “retro” setting and old but still playing am radio that bring you back to ’80s istanbul immediately once you get in. 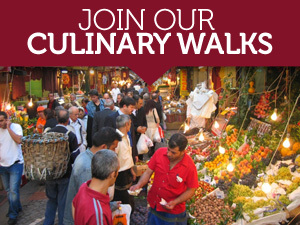 it’s on the left side of the road that leads to ortaköy, hard to miss.